The Paperclip Chronicles document adventures involving the humble paperclip, a piece of office stationery so versatile that it has become a staple (no pun intended) of my day-pack. It turns out that paperclips are handy for removing the pits from cherries. Who’da thunkit? Just dig the paperclip into the middle of the cherry and pry out the pit. Learned this trick at Hot Yam! for our July 15th meal from Hannah Sobel. Remember to sanitize the paperclip, first! About a month ago, I switched cellular service providers from Rogers to WIND Mobile. Aside from the abysmal quality of the phone or more precisely, the Android operating system, I purchased for use on the new network, the cellular network infrastructure requires some work. Indeed, WIND Mobile is well aware of this problem and has a page called Network Builder to report coverage issues. It might be better if this process could be automated. 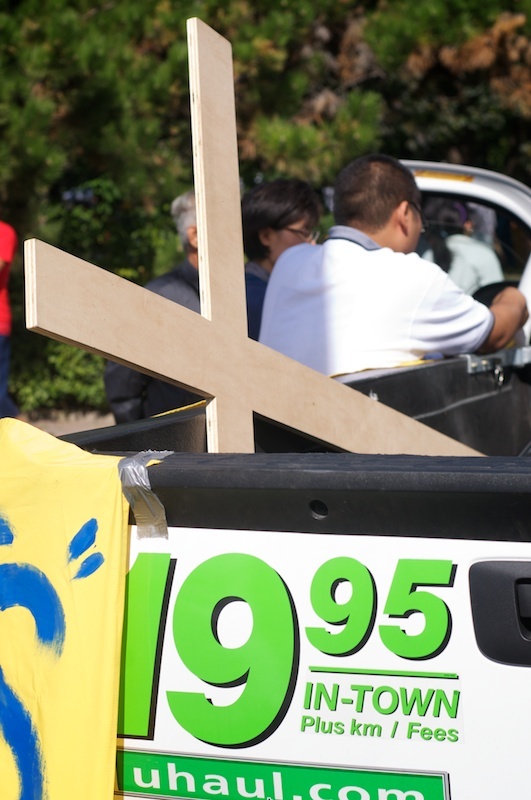 Saw this at a parade on the weekend… When Jesus said, “Take up your cross and follow me,” I somehow doubt He had a U-Haul in mind.